Monticello High School is an Albemarle County public high school. Monticello is part of the Southern Feeder Pattern. Monticello students attended either Burley Middle School or Walton Middle School. As of 2012 Monticello has 1,100 students enrolled. Monticello High School was built for $24 million. 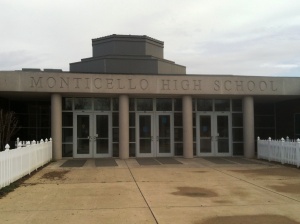 Named after Thomas Jefferson's mansion estate, Monticello High School opened in 1998. Monticello seniors participate in a special program every year called the Monticello High School Citizen Action Project designed to teach students about United States public policy. The school's mascot is the Mustang. The current principal of Monticello High School is Rick Vrhovac. 2012 - 2017 Jesse J. Turner, Jr.
Monticello High School is located at 1400 Independence Road. ↑ Web. Monticello High School Profile, Albemarle County Public Schools, retrieved June 4, 2012. ↑ Print: High school completion set for August, Daniel M. Nonte, Daily Progress, Media General April 2, 1998, Page B1. This page was last edited on 22 January 2018, at 16:54.